The Two Lasses have prepared a helpful guide that may assist you in choosing the kiln best suited to your needs. This Glass Fusing Kiln by Jen-Ken is the same model the Two Lasses love and use in their own studios and in their popular classes! It can be used for virtually any glass fusing project from creating fabulous dichroic glass jewelry to dishes and votive candle holders. Click here for detailed product and shipping information. 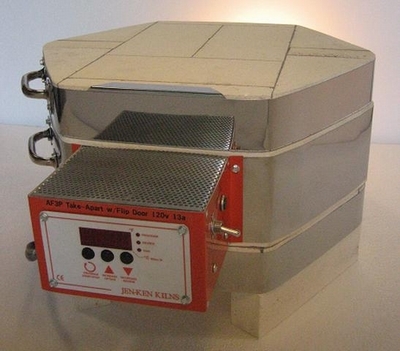 Click here to view the spec sheet for this kiln. 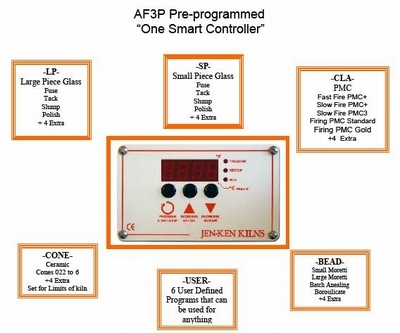 This AF3P 11/4.5 Glass Fusing Kiln by Jen-Ken is fully programmable, featuring the NEW Orton AF3P Pre-Programmed One Smart Digital Controller that offers pre-set programs AND allows you to program your own firing schedules as well! Click here for detailed product and shipping information. This terrific kiln features the NEW Orton AF3P Pre-Programmed One Smart Digital Controller and has a lift up lid in addition to a very nice 2 inch flip door for quick and easy placement of beads on mandrels or glass pieces on puntys. 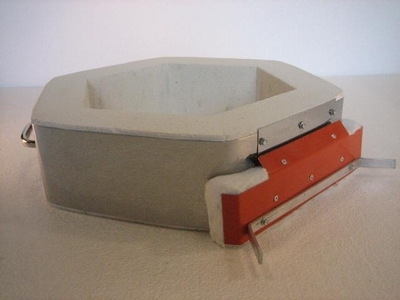 This is the perfect kiln for lampworking artists who may also want to slump small dishes or create fused glass tiles. Click here for detailed product and shipping information. 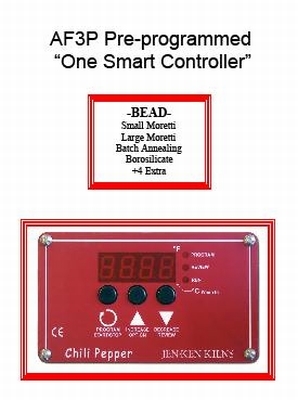 The Jen-Ken Chili Pepper Bead Annealer features the NEW Orton AF3P Pre-Programmed One Smart Digital Controller and was designed specifically for annealing beads, small lampworked sculptures and perfume bottles while they are still on their mandrels. This fabulous annealer is lightweight and portable, enabling the artist to work anywhere. Click here for detailed product and shipping information. The Jen-Ken “Cre-8” SQUARE Glass Fusing & Bead Annealing Kiln features the NEW Orton AF3P Pre-Programmed One Smart Digital Controller and FOUR completely separate, stackable sections to set up in any configuration that you wish! One of the removable collars features a 2" flip door that makes it a snap to anneal beads on mandrels or insert glass pieces on punties! Click here for detailed product and shipping information. This brand new Take-A-Part Glass Fusing & Bead Annealing Kiln by Jen-Ken features the NEW Orton AF3P Pre-Programmed One Smart Digital Controller and FOUR separate, removable sections to stack in any configuration that you wish! One of the removable collars features a 2" flip door that makes it a snap to anneal beads on mandrels or insert glass pieces on punties! Click here for detailed product and shipping information. This amazing kiln will take your glass to a full fuse and back to room temperature in under two hours AND operates on regular (120V) household current! 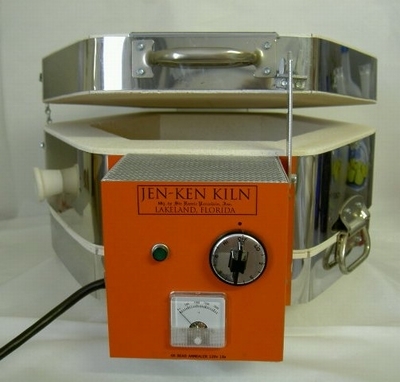 The Bonnie Glo 15/6 FIBER Kiln by Jen-Ken is the latest innovation in glass fusing kilns. 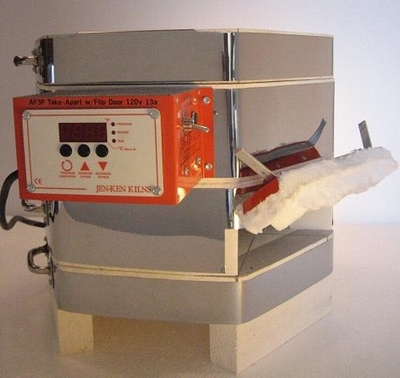 Crafted of a RIGID, industrial fiber medium, this kiln can full fuse glass in an hour or less (overall size and density of the piece will be a factor in determining speed). Unlike traditional kilns built of kiln brick and containing mullite kiln shelves, this kiln is made of a "temperature neutral" vacuum-formed, rigid fiber medium, which means that your glass heats and cools at its OWN pace, without being influenced by the slow heating (and cooling) required in a regular brick kiln. The glass bowl shown in the listing photo was fused in one hour and 15 minutes before then being slumped!! Another great feature of this fabulous kiln is that unlike other “polygon” shaped kilns, this kiln is ROUND, offering you more of what you want ... WORKING SPACE!! The Jen-Ken AF3P 15/6 Glass Fusing Kiln featuring the NEW Orton AF3P Pre-Programmed One Smart Digital Controller is a "small" kiln with some very BIG kiln features! It can be used for a variety of glass fusing, draping and slumping projects from dishes and bowls, to vases, tiles and other warm glass creations. Click here for detailed product and shipping information. 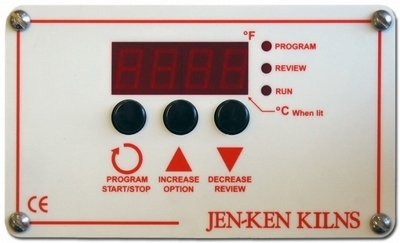 The Jen-Ken AFG-(JK)2-11 Kiln offers something new for artists who buy their glass in squares. 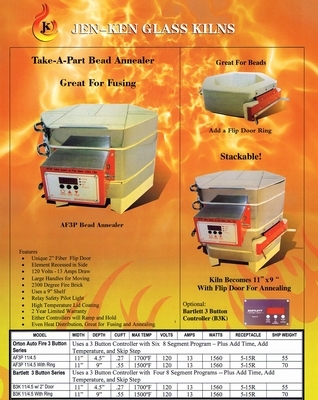 New in 2006, this kiln's unique design provides maximum working area with a 24" x 24" square kiln shelf! Click here for detailed product and shipping information. 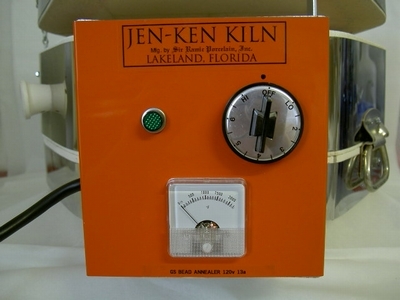 The Two Lasses are authorized distributors for the complete line of Jen-Ken kilns. Please contact us for competitive pricing and information on any other size/model.